Parents and students of JSDA, it is with great pleasure and excitement that we inform you that we will soon be moving to a significantly more spacious and accommodating new studio! We have seen our JSDA family grow and have been aware of our need for an updated space; one with larger studios, higher ceilings and updated flooring. 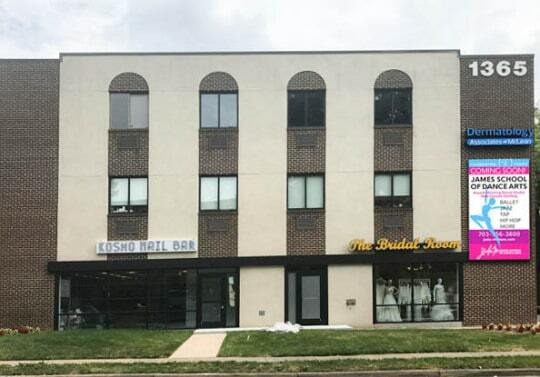 We are pleased to say that this fall we will be moving in to the entire third floor of 1365 Beverly Rd, McLean, VA 22101. The convenience of our studio families is of the utmost importance to us, which is why we’re thrilled that the new studio is only MINUTES from our current location. The James School of Dance is celebrating 60 years as a fixture of McLean, and your support and loyalty has helped us grow. It has been our desire to thank you by creating a better space to serve our students, with a studio that can grow along with them. The new studio is currently being renovated to make it into the space we’ve been dreaming of, but major renovations like this take time. We have procured adequate space for our students to continue their training without any delay to our new year beginning Monday September 11. Classes will be held at an intermediate location 1313 Dolley Madison Blvd, Suite 300 as we transition from our current location to our new home, but our schedules will not be changing. This is an exciting step forward for JSDA and its students, and we are looking forward to all of the wonderful new opportunities we will be able to offer our them in the future. We cannot wait to see you at the new JSDA location! NOTE: After August 31, we will no longer be at the studio on Whittier Avenue, we will officially begin the season at the interim location on Dolly Madison Blvd on September 11, 2017.